I hate letting good fabric to waste, so when Mom was thinking about some Oz fabric line scraps in with all her other scraps, I immediately scooped them up, knowing that I had a jelly roll at home with the same fabric line. With adding a bit of yardage for the half square triangles and background setting triangles, I had a quilt in no time. Here is a better view of the actual block I created. It’s like a half log cabin block only with a triangle for the cornerstone. **Because I used leftover scraps, I cut the largest pieces first so that I knew I would be able to get all of the pieces I needed. 6- 12 5/8”squares—Subcut twice diagonally. 2- 6 5/8” squares—Subcut once diagonally. 1. Using the coordinating ½ yard of fabric-I used yellow, cut a total of 4- 2.5” x WOF strips. Using jelly roll remnants and an easy angle ruler, make 72- half square triangles. Sew using a quarter inch seam and press to the jelly roll print. 2. Following the diagram, assemble block with coordinating solid triangle pointing outwards. Make 78 blocks switching up the placement of the prints except for the corner triangle block. It is important to use an accurate quarter inch seam to ensure that the block fits together correctly. 3. Assemble quilt in a 6 x 7 on point setting. 4. Quilt as desired. If you want to see how mom quilted mine, you can see it here. That winds up this fabric line. Between mom and I we have made so many projects with the fabric….here’s a list: Mom made this one as a graduation present, another graduation present, a baby quilt and a Schibble all from that same fabric line. She even made a ponytail holder with the slivers of left over fabric from the line. If you make one of these, we’d love to see a picture of it and feature it here on the blog. Send us an email at rogjok@iowatelecom.net. If you are looking for more tutorials, check out the right side bar. We have more. If you are looking for today’s current blog post, you can find that here. 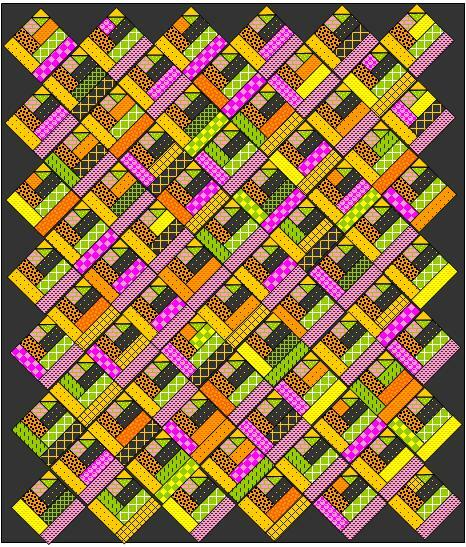 This entry was posted in Quilting on August 31, 2013 by Jo. Fabulous! Can I use just one jelly and halve the other measurements? Thank you for your tut on the log cabin quilt block. I am a slow learner, my best friend is my seam ripper. Thank you. How great is this pattern. I’ve several scraps that would work with a few pre cuts & I too could have a quick gift. Thank you ever so much for sharing your imagination & talent. You are so generous. Where can I find the oz line of fabric? Love the log cabin quilt! On last cutting instruction…..are these triangles for corners? If so, doesn’t that out diagonal on outside? Should it only be 2 squares….1 diagonal cut…HSTs Great idea for scraps thanks…. how is the dark fabric added? I love this pattern and have nearly finished the squares.just wondering how I attach the triangles, after the squares are sewn together in rows or before? The quilt is set on the diagonal. The triangle pieces are the last pieces sewn on to each row. What doe WOF stand for? Want to make this quilt. By any chance have you determined the fabric requirements & cutting instructions to make this pattern in a baby size quilt? Thank you! We haven’t. We made it so long ago and gave the quilt away so we don’t even have it for reference. Sorry. Can you tell me the size of the block when it is finished before the big blocks are put together? Hey Carolyn–The blocks should be 8 1/2 inches before they are sewn into the quilt. Hey Linda–The half square triangle will need to finish at 2 1/2 inches before you sew it into the block. If you use a 2 1/2 inch strip and a easy angle ruler, you will have the right measurements to make the half square triangle part of the block. Hi Donna–I would recommend checking your quarter inch seam allowance. I have rechecked the math and the final strip should be cut at 2 1/2 inches by 8 1/2 inches to make a 8 1/2 inch unfinished block.